To build and maintain an audience on your blog is not too much hard work, but it takes commitment. Low readership stats can be discouraging to first-time bloggers. It’s easy to feel that you’re shouting into the void and no-one is listening! This guide shows you how to build and maintain an audience within your research community. What makes your blog stand out in its field? This can be a daunting question, especially when comparing yourself to more experienced bloggers. As an Early Career Researcher, your fresh approach to your subject is your strength. Some of the best blogs highlight the work-in-progress aspect of research – your readers will return to your blog to see how your methodology is developing. Find a style that suits you and stick to it! It’s good to be informal but show your grasp of material and discourse. Be clear about what’s relevant to your readers and your style will flow naturally. Don’t forget: insight is important but so is expression. Make it easy to find your blog! Several sites index research blogs by subject, allowing browsers to discover relevant material. 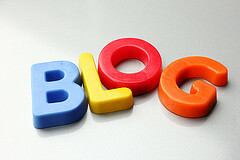 Registering your blog on a few of these is a first step toward attracting an academic audience. The Academic Blogs wiki (http://www.academicblogs.org) divides its blog listings by discipline. It is run by academics as a dedicated resource. Technorati (http://technorati.com/) is a search engine that categorises your blog by the way you tag posts, and by the number of other bloggers who link to you. Science Blogs (http://scienceblogs.com/) invites bloggers to join its team of featured writers, bringing the best in scientific research to its wide readership. Blogs Nature (linkto: http://blogs.nature.com/) also acts as a portal to featured writers, and indexes hundreds of third-party science blogs. Great minds don’t always think alike, so set up an RSS feed to keep track of other research blogs. Use your account to leave comments on the best of these. This allows other readers to click through to your page and encourages dialogue. Establish yourself by contacting other bloggers, asking them to add you to their blogroll (their list of recommended blogs). If readers leave you a comment, reply promptly. It’s good to establish dialogue with your audience and this will encourage other visitors to comment. Even if you disagree with what’s being said, remain polite at all times. Don’t forget: the personal touch is important. Write an ‘about’ page for your blog, explaining your research interests, or link to a profile site with more detail. Find a rhythm for your blogging. Regular updates will keep your readers engaged, and will show that you are full of ideas! If you know you’re not going to be able to blog for a while, your software will allow you to write posts in advance and schedule their publication. You needn’t blog every day, or even every week, but a consistent output helps to make your audience comfortable. Offer email subscription in a prominent place on your blog, with Feedburner (linkto: http://feedburner.com/). Social media sites are increasingly becoming the way that people find blogs. Set up an account on Twitter or Linkedin and start collecting followers. Linking from these sites gives your readers every chance to know about your latest blog post. They also provide another forum for discussion and networking. You might want to incorporate social media microblogs or social bookmarking activity into your blog, increasing your productivity and creating continuity across your web presence. Thanks very much for this! I am a new research blogger trying to increase my readership.. very helpful tips!